New! Horse Disease Tests can now be ordered through our Webshop! A DNA Identity Test establishes an animal’s identity through a DNA profile, using a panel of ISAG-recommended microsatellite markers. A DNA Parentage Test determines kinship by comparing the DNA Identity profiles of offspring and potential parents. Prognostic, Pre-breeding, and Diagnostic Testing: Hereditary Disease Tests predicts if an animal will be affected with, or be a carrier for, an inherited disease. Phenotype tests predict physical traits, such as coat color or hair length. Blood group testing to prevent “Neonatal Isoerythrolysis (NI)” in foals. Here you’ll find all the information for a basic understanding in animal genetics and inheritance of hereditary diseases and traits such as coat color and height. Knowing your animals genetic disposition may help to prevent hereditary diseases and to optimize your breeding success. How can we help you? If you have questions about any aspect of Companion Animal Genetics, check out our resources, or ask us directly. Click the link below for special offers and prices for members of breed clubs and interesting project. Full Dwarfism panel now available: Skeletal Atavism and ACAN mutations! 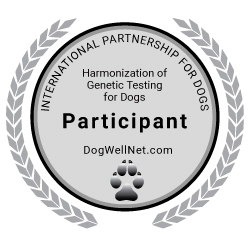 CAG is proud to be a founding member and participant of the IPFD, Harmonization of Genetic Testing for Dogs. CAG is a proud member of ISAG.